At Dickey’s Barbecue Pit, each Owner Operator is the Pit Boss of their restaurant. 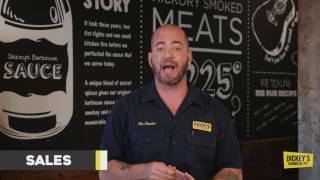 Every Dickey’s franchise owner trains for four weeks at Barbecue University, Dickey’s training program designed to teach every Owner Operator the business of barbecue. 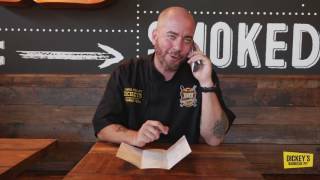 In the four weeks, franchisees learn everything from how to smoke a brisket to knowing the ins and outs of the restaurant business. Of course, the learning doesn’t end in the classroom. 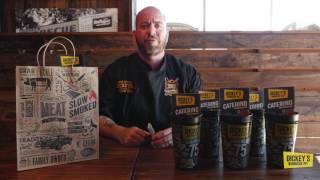 Dickey’s training team produces daily Shift Management Training Videos to ensure Owners Operators and their Pit Crews are always sharpening their barbecue knowledge. 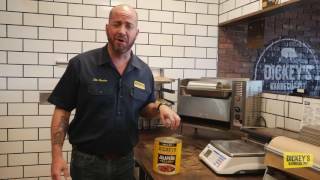 Dickey’s sources only the highest quality meats to serve in their stores. 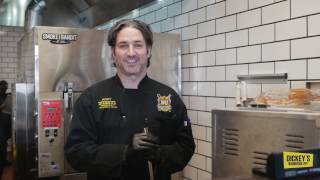 Dickey’s offers guests’ hand-selected, hand-rubbed, antibiotic-free meats on a menu that features our famous Beef Brisket, Pulled Pork, Chicken Breast, Polish Kielbasa Sausage, Jalapeño Cheddar Kielbasa, Turkey, and Pork Ribs. Meats with No B.S. (Bad Stuff). At Dickey’s, our Texas barbecue is always slow-smoked and served hot. True Texas barbecue (like we’ve said, not Texas BBQ) is a process—slow-smoked to perfection. This process helps break down the fat in the meat and adds a unique smoke flavor. 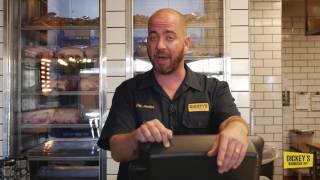 If you ask any Dickey’s family member, they will tell you that there is nothing better than pulling a brisket out of the smoker with a beautiful smoke ring. 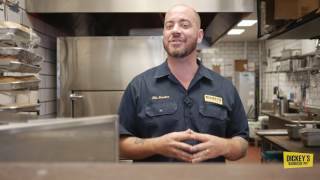 At every Dickey’s Barbecue Pit restaurant, the passion and care that goes into smoking our meats is also put into serving our guests. Each Owner Operator serves up delicious meats, savory sides, buttery rolls and, of course, a heaping side of southern hospitality.